Writing about Justin Simien’s barnstorming debut feature Dear White People (2014), critic Armond White drew a line between the film and the Hollywood gatekeepers’ usually self-congratulatory cinematic response to race in America: “Simien’s humorous sensibility must deal with the fact that the racial…attitudes of American film culture are controlled by a social class that demands its own recognition first.” It’s a searingly prescient jab that gets to the heart of race in American film in the 21st century. Dear White People cuts straight through prejudice, identity hang-ups and guilt complexes, laying out its thesis with such raw intelligence that nobody, regardless of background, will come away unruffled. 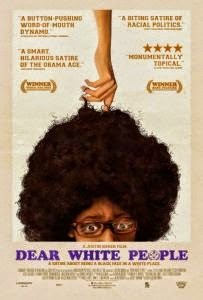 Dear White People exposes the “post-racial” American consciousness as a myth of convenience, relentlessly pursuing its quarry with such blazing wit that it not only undermines the national media conversation about race in the Obama era, it presents its own version of it that feels open, honest and necessarily awkward. Simien’s debut is ostensibly a campus comedy following the lives of four very different black characters in a predominantly white (fictional) Ivy League university. Sam (Tessa Thompson), a radical, outspoken film student; her ex-lover Troy (Brandon P. Bell), a model student and son of the college dean; Coco (Teyonah Parris), a self-obsessed social-climber; and Lionel (Tyler James Williams); a quiet, gay student who yearns to be a journalist. It may seem glib coming from a white critic, but Dear White People is so articulately pointed, that several white commentators will inevitably try to temper the force of the picture by asking how it relates to their own attitude to race. But this isn’t a film about them; this is a picture about the young black experience and how certain decisions take place in light of that identity. Simien is concerned with how we define and identify ourselves. The film sensitively but rigorously explores how history, background and aspirations are varyingly applied across individuals. Dear White People brilliantly paves its own racial conversation by acknowledging the delicate, shifting balance between internal and external pressures. Dear White People also captures the insidious racism inherent in the culture of the wide-eyed, earnest millennial. It sees black culture reduced to a patchwork of easily-assimilated types that can be appropriated by white youth. The picture yields comic dividends from these scenes – from the wealthy frat boy’s use of hip hop vernacular to the newspaper sub-editor who insists on touching Lionel’s afro – but it’s also where it finds its bite. The admittedly amorphous and scattershot events of the film eventually lead to a jaw-droppingly horrifying blackface Halloween party. What becomes clear is that, what may seem like a collection of gauche passing comments throughout the film, gather into a tempest of complicity that allows the party to take place. It’s hard to think of a smarter, more dynamic American debut in recent years.